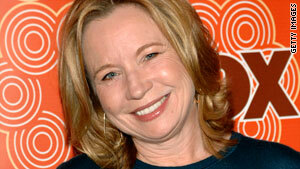 Debra Jo Rupp plays Kitty Foreman from "That '70s Show." Fantastic mom was Jean Weir (Becky Ann Baker) from "Freaks and Geeks"
One of the best mother-daughter-friend relationships was on "Gilmore Girls"
(The Frisky) -- It's not easy being a mother, caring so much about these delicate little dumplings that hold half of your DNA and keep putting themselves in danger. Which is why it's important to not just acknowledge the worst TV moms, but also the best. My personal favorite is Kitty Foreman (Debra Jo Rupp) from "That '70s Show." She didn't just raise Eric; she mothered the whole neighborhood of delinquent teenagers while working full-time as a nurse and dealing with a grumpy husband. And she managed to do all that while maintaining her sense of humor, with a little help from her dear friend Kahlúa. Another fantastic mom was Jean Weir (Becky Ann Baker) from "Freaks and Geeks." Because no matter how broody her daughter Lindsay got, she was always upbeat and supportive. I definitely cried a bunch during the Halloween episode when she's excited to give out candy with her daughter, but Lindsay ditches her for James Franco and Jason Segel. Not that anyone can blame her. All the parents on "Modern Family" are pretty great, but I love Gloria (Sofia Vergara) because she's raised the most precocious little boy, Manny. And she honestly loves Jay way more than his last wife Peggy, from "Married With Children." She's also terribly good-looking and tirelessly cheers on her family. My favorite character from "The Golden Girls" was Sophia Petrillo (Estelle Getty) because she said the most amazing things ever. And even as a 90-year-old, she was still raising Dorothy -- even though she was younger than Bea Arthur in real life. Sure, Marge Simpson sometimes forgot about Maggie's existence and Bart turned out to be a brat, but you can't argue that she did a good job with Lisa! And since "The Simpsons" has been on longer than any other show, she's been raising those un-aging kids for 21 seasons. And on top of that, Homer is a bigger baby than any of the kids. But Marge still gets up every morning, does her fro, and loves the hell out of her family. If Rayanne's mom was one of the worst TV moms, then Angela's mom, Patty Chase (Bess Armstrong), from "My So-Called Life" was one of the best. Her daughter was one of the emo-est teenagers ever and with a bad boy boyfriend like Jordan Catalano, she should have been pulling out her hair. But she managed to be a working mom and give Angela the space to be independent and make some mistakes. When things got dangerous, she stepped in and came to the rescue. "The Cosby Show" was an enviable home environment and Clair Huxtable (Phylicia Rashad) managed to have a successful career as an attorney while raising five kids. She was such a beautiful, confident woman and she doled out the lessons like no other. Plus, she was always dancing and wearing really amazing '80s fashions. I secretly loved "The Lizzie McGuire Show" and Lizzie's mom, Jo McGuire (Hallie Todd), was so sweet. She reminds me of my mom, always trying to be Lizzie's best friend and getting super emotional when Lizzie went away on trips. She did often mess up Lizzie's life when attempting to solve her problems, but Lizzie and Jo had one of the most tender mother-daughter relationships ever. Marion Cunningham (Marion Ross) from "Happy Days" was similar to Kitty from "That '70s Show," but much less of a lush. She was the only one allowed to call Fonz his real name, "Arthur," and she was always doting on her grumpy husband, Howard. She also raised two pretty good kids and was a fantastic cook. One of the best mother-daughter-friend relationships is between Rory and Lorelai Gilmore (Lauren Graham) on "Gilmore Girls." She had a rough start -- what with the getting pregnant before graduating from high school, while out of wedlock, and with estranged parents -- but she gave absolutely everything for her daughter. Who doesn't want to be part of their fast-talking, smart-aleck brood? They love and respect each other. And enjoy witty repartee on top of that.